Network Spotlight: Bootheel Health Alliance, Missouri Bootheel Regional Consortium, Inc.
Cynthia Dean, CEO and Rhonda Diebold, Community Outreach Specialist, were interviewed by the RHI Network TA team to share information on their network’s characteristics, rural advantages and challenges, keys to communication and collaboration, and advise for network success. 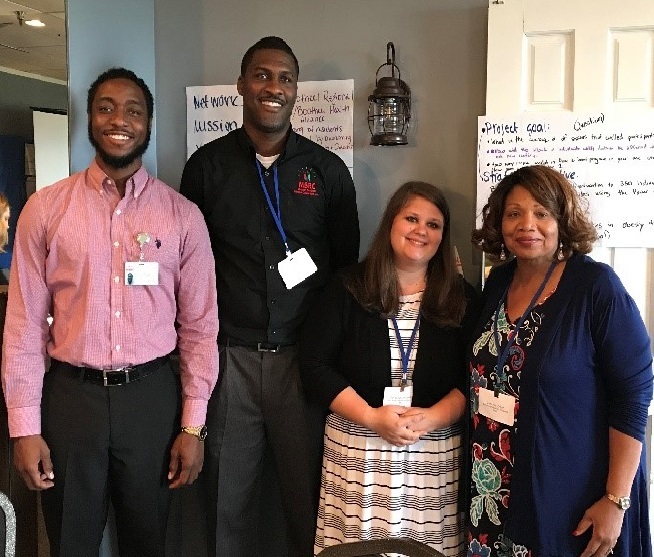 A: Bootheel Health Alliance (BHA) is a diverse network comprised of seven partners who have agreed to collaborate in order to improve the well-being of residents in the Missouri Bootheel. The counties we serve are: Dunklin, Pemiscot, Mississippi, New Madrid, and Scott. Our grant program focus is helping to overcome health disparities in obesity and diabetes. Aside from the Rural Health Network Development Program, our network has two additional HRSA grants, the Rural Health Care Services Outreach Grant and the Rural Health Network Development Planning Grant. We coordinate with both of these programs for the purpose of expanding our efforts and outreach. A: Our network members value the collaboration that a network brings. They appreciate the opportunities to work together to address one specific goal, as well as enhance their own work. The outreach that our network provides enables them to vastly increase awareness about diabetes and the importance of diabetes education. By increasing community awareness, community members are more apt to receive education on preventing and/or managing diabetes. Also, the organizations within our network have such a broad spectrum of grant programs, that provide members access to education, tools, resources, and trainings that are very beneficial. Q: What types of organizations are you currently work with and/or interested in recruiting for membership or partnering with? A: We are currently working with churches, faith-based organizations, non-profit organizations, community-based agencies, health care providers, MO Hospital Association, FQHCs, home health agencies, Southeast Missouri Rural Minority Health Coalition, recovery centers, YMCA and a Regional Healthcare Foundation that provides prescription drug assistance. We anticipate adding more partnerships within these types of organizations. Q. How has your network approached communication and collaboration, and what best practices to you have? A: Our members are very proficient in making referrals within the network and within other programs, as well as monitoring those referrals to ensure appropriate steps have been taken. Other ways we strive for strong communication is the use of monthly e-blast updates, face-to-face meetings, email, and phone calls. We also feel it’s extremely important to get commitment from the senior levels of our member organizations. This helps with the level of engagement and buy-in and strengthens relationship dynamics. Due to the complexity of our members’ schedules we will often go to our partners when they can’t come to us. All network partners turn in weekly reports regarding network activity for the week. This allows us to be timely with corrective action if there are obstacles. We also find it beneficial to utilize social media for promotion and education. A: Transportation, as with most rural communities is a challenge. Having a means to get to diabetes education classes or even a grocery store can be a barrier. Therefore, attendance for the classes varies. We are surrounded by fast food restaurants with few grocery stores, also known as a “Food Swamp”, making shopping for healthy food even more of a challenge. In addition, a large portion of our population receive subsidies, therefore are hard-pressed to eat the more local, convenient, and less expensive food. The stigma around diabetes and mental health is another area of concern. The false impressions related to diabetes and mental health prevents people from getting the education they need, as it would mean exposing themselves. The shortage of health care providers is another obstacle we face in rural communities, as our health care providers are feeling completely stretched. Q: What are some of the advantages of working in your rural environment? A: Rural does not have the resources that urban has, therefore we need to work smarter. Rural networks build strong collaboration and have firm partnerships in place, as well as robust community involvement. Another advantage to working in a rural setting is getting to see firsthand, the changes and success stories from our diabetes program participants. They are losing weight, eating healthy, and feeling an overall sense of pride in their accomplishments. Participants have also reported their health care providers reducing medication or taking them off of medication completely. Q: What types of initiatives are you currently working on? A: Aside from ensuring that our grant deliverables are being met, we are planning a care coordination workshop for our providers and partners, focusing on strengthening us a network. We will also be going into the schools and partnering with other organizations, to address childhood diabetes by educating the entire family with a parental focus, in order to create change. The BHA Program has been invited to speak at Family Fun Nights which are part of the Childhood Obesity Prevention Program (Rural Health Care Services Outreach Grant) held at local Housing Authorities, Outreach Centers, local churches and other community organizations such as the YMCA. We work to carefully capture data across network partners and are consistently studying the data to review our progress and make necessary changes to ensure program success. Q: Tell me about a difficult situation your network has recently faced and how you’re working to overcome it. A: Early on, we were challenged in the way our FQHCs were structured. We weren’t getting the referrals we needed, therefore we developed flow charts to help them navigate through the referral process more easily. We were also able to meet face-to-face with the Community Health Workers embedded at the FQHC, which helped break down any additional barriers. Furthermore, we have been able to integrate ideas from other programs within our organization and apply them to this project. Q. Based on your experience as a network leader, what advice would you give to a developing rural health network? A: Quality network staff is important, as well as engaged network partners. It’s essential that everyone understands the community and their needs, as well as have an awareness of what each network partner does and what they bring to the table. Breaking down silos can be difficult but is crucial. Ensuring a coordinated approach to network communication and collaboration efforts, both in and outside the network is important, as well as creating a strong community presence. A strong network member orientation process is also beneficial. Smaller organizations such as churches may need education and guidance in areas such as, MOUs and work plans for example, as well as clarification about their role as a network member. And finally, we would advise caution when determining a service area for your project work. If it’s too large, it may limit the network’s ability for collaboration and to do what they need to do within designated time frames. It takes time to learn about, and relate to the culture of each community, and developing relationships and trust takes even longer.